Ten years ago, Doctor of Chiropractic, Geoff Ricchio, published a controversial article entitled Creating a Profitable Massage Therapy Program. This article infuriated many massage therapists, for good reason. Rule #1: Massage therapists are difficult to deal with. Make no mistake about it, MT’s are at times scary people to deal with. All my problems with workers in my office have always been with massage therapists. They have a hard time adhering to normal office hours or even office protocol. Rule #2: Never overpay a massage therapist. When these people get out of school, they seem to think they deserve $60 per hour! Yet, I’ve found that MT’s will work harder for you at $20 per hour than $60 hourly. It’s important that you set up a payment schedule that not only rewards them for good work but more work as well. Rule #3: Only hire female therapists. I know this is wrong to do, but it only takes one male massage therapist to touch a woman inappropriately and you're sued and shut down by the Sheriff's department. Rule #4: Create a low cost massage program for the general public so that they can use your office for low cost massage therapy. I have a system for Chiropractors that enables them to create a profit center that pays them a regular income month after month. My massage program paid my office $24,500 every month for years. Not bad income for a wellness program. Rule #5: Have your massage program available for the business community. Many businesses around your office would love to set up a massage wellness program for their employees. You can do this for them and make an incredible amount of monthly income. This is a terrific way to increase your new patient base. Rule #6: Do massage seven days per week. That’s right, your office could be generating income for you even on Saturdays and Sundays. I found that Sundays have been an incredible addition to my office. People love to come in on the weekend because they are free. We’ve even done massage until 10pm! The attitude Dr. Ricchio displayed toward massage therapists in his first three rules created a powerful backlash from the massage therapy profession. However, in the past 10 years I have seen little reaction from the Chiropractic profession to this article. As a Doctor of Chiropractic who has employed massage therapists in my private practice for 14 years, I would like to offer some alternative rules for integrating massage therapy into a Chiropractic office. Rule #1: Doctors of Chiropractic must respect massage therapists as licensed health care providers, as colleagues, not just employees. Massage therapists have State licenses, pay annual license renewal fees and have annual continuing education requirements, just like any other licensed health care provider. My massage therapists’ names are on the front door my office, just below my name. My massage therapists’ diplomas are hanging in the lobby of my office, right next to my Chiropractic diploma. Treat massage therapists as a fellow health care providers, because that is what they are. Rule #2: DC’s must hire the right massage therapist. Some massage therapists are NOT great employees. Some massage therapists ARE difficult to deal with. Some massage therapists DO have a difficult time adhering to office hours and office protocol. Solution: Don’t hire those massage therapists! There are massage therapists who are excellent employees, interview until one is found. Rule #3: DC’s should hire massage therapists who are specifically trained in myofascial release and other soft tissue techniques that will complement a Chiropractic practice. Massage therapy (CPT code 97124) and myofascial release (CPT code 97140) are billable services under many insurance policies. Massage therapists who do only “energy work” may not be a good fit for all Chiropractic offices. Rule #4: DC’s should hire massage therapists as employees, and pay them $30 per 60-minute massage therapy session. The office can offer an introductory massage therapy special of a 60-minute session for $30. This way the office will break even on the introductory session, not lose money on it. If the patient is happy with the massage therapist, they will come back and pay the regular prices, and the office will make a profit. Most massage therapists will be happy with $30 per 60-minute massage therapy session as an employee. Rule #5: If a DC decides to hire a male massage therapist, hire the right one. Some male massage therapists DO touch women inappropriately. Solution: Don’t hire those massage therapists! I have employed several male massage therapists with no problems. There are responsible, professional male massage therapists, interview until one is found. Rule #6: Hire massage therapists who can work other positions in your office. I currently have two massage therapy room, and three licensed massage therapists. One is my Manager who does massage therapy two half-days per week. The other LMT’s do the majority of the massages and are paid hourly to work in the Back Office when the Manager is in a massage therapy session. A full week of massage therapy sessions can be very physically demanding. If you have several massage therapists who can also work in your Back Office, you can rotate them so they get to do what they love, massage therapy, without beating themselves up too much. The bottom line is, Doctors of Chiropractic should treat massage therapists with respect, as fellow health care professionals. The benefits for the Chiropractic profession and the massage therapy profession will be profound. Great doctor and staff! Office is beautiful, highly recommend. I had received massage from Ashlyn. It is one of the best massages I received. Olivia and her staff are great. The new office space is awesome with spacious rooms and whole ambiance is great. I look forward to going to Dr. Brown office for my future appointments. Dr. Brown is wonderful and kind. He has helped me heal through several injuries and continues to help me through regular adjustments. He and his staff are friendly and truly care about their patient's health. I recommend them to everyone! This place is very helpful and has quick service, however, it is crazy expensive. They do have wonderful massages though! They are cheap and fantastic! In 4 visits, I spent, out of pocket, over $1000 WITH having insurance. I was promised it would heal me quicker than a cheaper traditional chiropractor, and it did not. Was told to get an MRI that would cost me another $600 bucks. I ended up going to another place that fixed me up in 3 more visits for $40. Great Doc and amazing staff! Very personable, remembers you as a patient even if its been a few months. Great staff and best bet is to get a massage then adjustment. Won't be disappointed with this doctor. I have always received the best treatment, advice and medication when I visit Dr. Brown's practice. His staff is also the most professional! 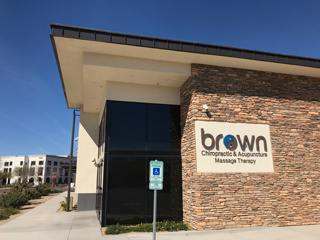 The staff is very nice and Dr. Brown won't make you feel rushed. He'll ask about your pain and either try to fix it or refer you to someone. Excellent doctor and supporting staff. He provides comprehensive treatments and is very flexible at trying to meet your needs. He is better than any chiropractor I have ever tried.